It's difficult to pinpoint exactly when humans began using hooks to catch fish, as rudimentary prehistoric hooks made of bone, antler, and other natural materials have been unearthed in archeological digs. The very first fishhook was actually a gorge, a short, straight shaft with pointed ends that, when buried in a bait and swallowed by a fish, would turn and lodge in the fish's gullet as the angler tugged on the line. Other prehistoric hooks that have been unearthed closely resemble modern versionsa curved object with a point on one end and a notch to tie line on the other endexcept, of course, for the fact that they might have been made from the angler's dead neighbor. Keep hooks sharp. The sharper the hook point, the easier it enters the fish. Most all fishhooks have a barb, which is a sharp, angled protuberance below the hook point. 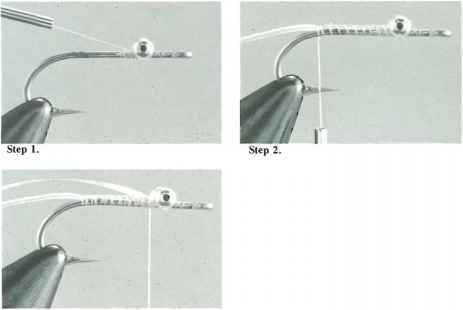 The hook must sink into the fish past the barb to ensure a solid hookset. If it doesn't, the fish stands a good chance of getting off. A hook sharpener (see Chapter 11) costs about as much as a package of a dozen small hooks, and you can hone the point of a hook with one in five or ten seconds. Set the hook solidly. 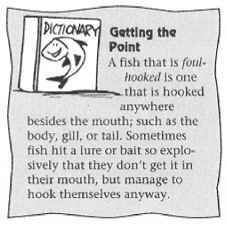 This is the most common fault of beginning fishermen I've known: They feel a fish hit the bait, then start reeling in. 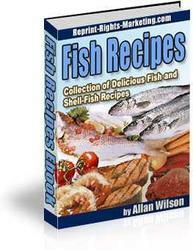 The fish feels the pressure, opens its mouth, and bait and hook pop out. Rarely does a fish hook itself solidly (unless it swallows the bait, which often doesn't occur until five or ten seconds after it mouths the bait, during which time the fish might feel the hook and spit it out anyway). Whether you are using a bait or a lure, you must lift the rod sharply, with no slack in the line, to drive the hook point deep enough into the fish's mouth for the barb to penetrate. Keep a tight line. Even if you have set the hook solidly, a fish can break the hookset as it pulls and turns in different directions. Many fish have bony mouths, and it takes a lot of pressure to sink a hook solidly. Also, considering how much monofilament line can stretch, what you thought was a deep hookset could be a very shallow one, with the point of the hook barely penetrating the fish's mouth. It's also important to use the right size and style of hook, covered next.